14k gold solitaire style lady's engagement ring. 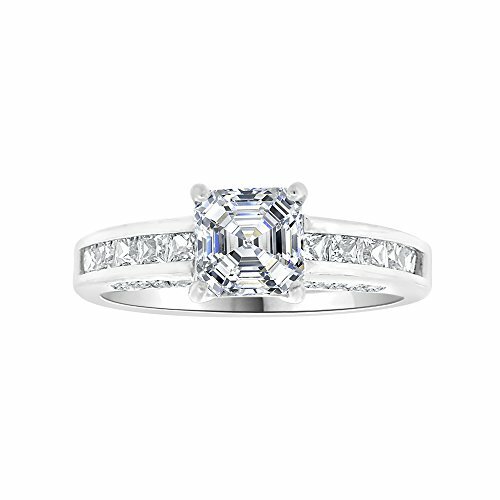 Fancy, modern, and unique, we use our finest synthetic cubic zirconia crystals for beautiful shimmer and sparkles. The gold surfaces are elegantly polished to a luster shine. Choose from any available sizes or for extra small and large sizes other than the sizes listed, please contact us for pricing and availability. Ships with signature requirement. Courier will not deliver without a signature release. For signature release waiver, please contact us prior to ordering. Beautiful sparkling synthetic cubic zirconia crystals. The center stone is 6mm in diameter, equivalent to a 1.0ct gem. Elegant and timeless design for all engagement, anniversary, & bridal occasions. Band is 4mm at the widest width with beautifully facetted brilliant round & princess cut side stones.